Chelmsford is growing and developing into a place where people want to live, work, shop, and spend time. With this growth, there is an increase in demand for travel on our already busy road network. At the moment, the road network has only 4% space left at peak times. There is not the available space in the city centre to increase capacity on the existing roads, or build new roads. This would also not solve the issue as it would further encourage extra car journeys and quickly use up the new space. We need a strategic approach to help solve the issues that are currently in existence on Chelmsford’s transport network. Looking to the future, we need to progress in a way that ensures that what we have in Chelmsford can be used and enjoyed for generations to come. Investing in sustainable transport methods is therefore a key part of the solution. We also need to challenge the way people think about travelling to, from and within Chelmsford. We need to make alternatives to the car attractive enough to persuade people to alter their habits. 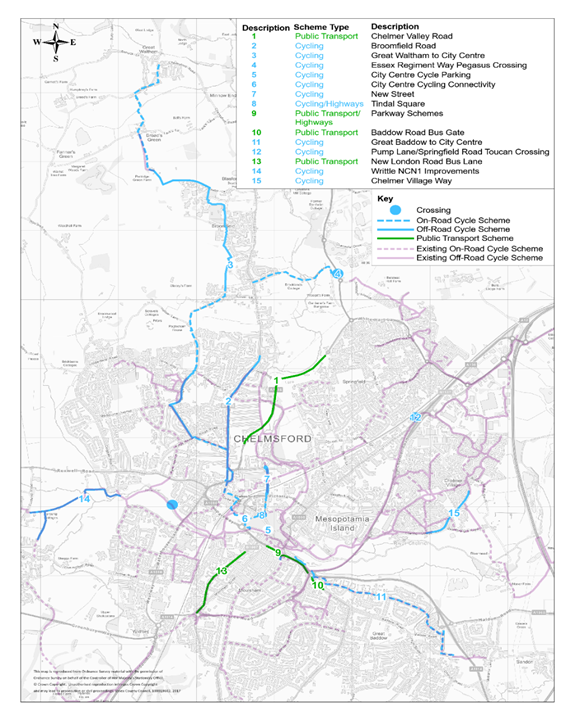 Essex County Council has secured £15 million to be invested in sustainable transport methods designed to help alleviate pressure on Chelmsford’s road network. These improvements to the network need to be made by 2021. The Chelmsford City Growth Package went out to public consultation in summer 2017. It includes a number of potential schemes. Public feedback helped us decide which schemes to bring forward in November 2017. As part of the Public Consultation we received over 900 responses from the public, businesses and other key partners. We have analysed these responses to help guide the selection of schemes to be taken forward as part of the Chelmsford City Growth Package. As the promoter of the package, we have also included a response to the public consultation to explain the decisions that have been made. To allow residents living between Meadgate Avenue and the Army & Navy to access the roundabout as they currently do. In November 2017 we announced 16 schemes combining 20 of the 30 proposals put to the public during the Chelmsford City Growth Package consultation. To find out more please see the Public Consultation Documents below and our presentation document. Baddow Road Bus Gate - changes to consultation proposals include: reduced to only peak hours and moved to Meadgate Avenue. This will be on an 18 month trial basis.